The metalwork of the Late Bronze Age in Epirus has its own distinctive features. A fair amount of bronze objects was in existence, manufactured of a copper and tin alloy. The only exception to the raw material used is to be found in a gold metal sheet and a gold bead. Tools (mainly axes and knives) and weapons (mainly swords, daggers and spearheads) were the objects used on a daily basis by a “household”. Alternatively or in parallel, they were used as symbolic or “prestige” artifacts, which denote the owner’s power and authority. Such objects were often acquired in the context of trading, the exchange of “gifts” or in a wider social framework, as proven by more recent ethnographic research. The quantity and quality of the existing bronze objects are in contrast with the prevailing conservative production and consumption of local handmade pottery. These objects are to be found in both cist and pit graves as burial offerings (intact weapons and jewellery) to accompany the dead on their journey to the afterlife. A second source is the two hoards of bronze artifacts (tools), found at Stefani in Preveza and at Katamachi in Ioannina. They contain intact functional objects, intended for exchange and use, as well as worn objects to be repaired or broken up to make new ones. Several bronze objects are isolated or chance finds (weapons and tools), probably having been used for obscure votive purposes. Local production of metalwork cannot actually be proven to have existed (note 1), seeing that there is a serious lack of rudimentary archaeological data (raw material, smelting, melting, slags, bellows, tuyeres, crucibles, moulds), which are often found in workshop areas. The absence of evidence is definitely due to lack of prehistoric settlements with stratified deposits. 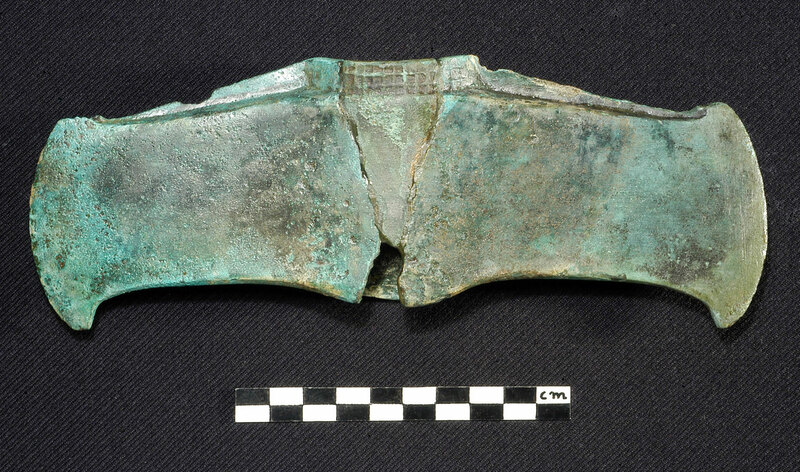 A combination of qualitative-quantitative and manufacturing-technological characteristics points to certain types of bronze artifacts (possibly axes) having been produced locally. Besides, Epirus has no particular tradition of production or use of metalwork, with the exception of a dozen Early Bronze Age single-bladed axes from various sites and a few Middle Bronze Age small knives from Dodona. The first direct proof comes only later from the Hellenistic-Roman city of Kassopi in Preveza (note 2). Metal objects acquire great value for their prehistoric user, seeing that they are the end products of complex and communal activities, which to a great extent cannot be controlled by the owner himself. Knowledge of and the exploitation of ore deposits, the beneficiation or smelting technology, commerce and dispersion of raw materials, experimentation in order to create enduring alloys, knowhow in the art of casting-shaping and finishing of objects, knowledge of the degree to which these objects are desirable and the subsequent setting of a “value” on them, all these presuppose the involvement of people from different areas and the existence of organized networks for distribution of raw materials and objects. Hoards are what we call relatively homogeneous collections of metal objects that are stored or hidden away for various reasons and purposes. The mass hoarding observed during the 13th-12th centuries BC is characteristic of the uncertainty throughout the Helladic (note 3) or Mediterranean area and even further abroad. The hoard of Katamachi in Ioannina (note 4) was discovered by chance in 1970 at a precipitous watercourse of mount Alysos or Vritzaha, at an altitude of 1.017 m. It includes five double axes of the Helladic-Mycenaean type with an oval shaft hole, a compact pyramidoid anvil with an oval fastening hole and a plastic knob, a conical chisel of a European type with a hollow socket, decorated with relief triangles on its base (fig. 1). These seven objects are intact and functional or show small signs of use-wear, which are repairable. They are probably the ware of an itinerant smith. This particular utilitarian hoard was hidden with the intention of its recovery, something which never came about. 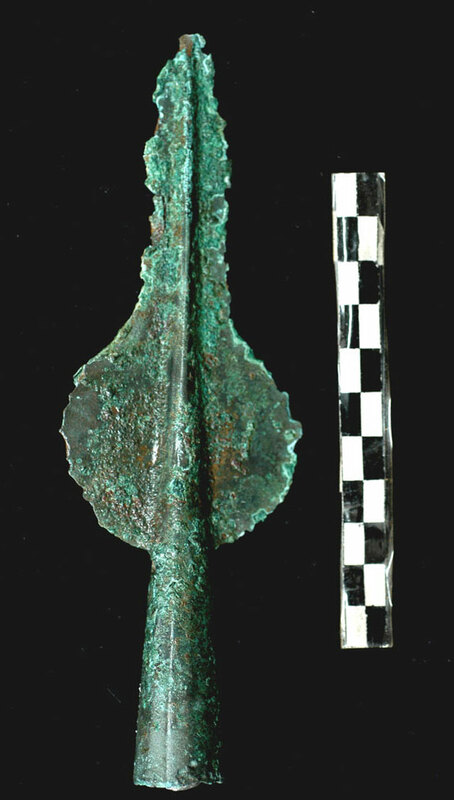 A bronze lanceolate spearhead found at the village area points to the existence of a nearby settlement of the Late Helladic ΙΙIΒ-C period. The second hoard from Stefani in Preveza (note 5) was accidentally found in 1985 in a limestone crevice of the hilly area that lies over the mouth of the Ambracian gulf, wherefrom natural paths lead to inland Epirus. The hoard consists of five bronze double axes of the Helladic-Mycenaean type and another five of the “Ermones-Kierio” variant with oval shaft holes (fig. 2), three bronze leaf-shaped spearheads, two bronze rods and two large whetstones (fig. 3). The utilitarian Stefani hoard has a mixed character, containing intact or damaged, but mainly broken artifacts. The hoard can be dated approximately back to the end of the Late Bronze Age or to the Late Helladic IΙΙΒ-C period. Foundations of buildings, handmade pottery and flint artifacts are reported as having been found nearby. 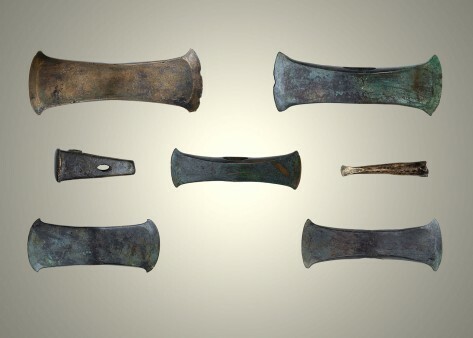 The Late Bronze Age Epirus’s “toolkit’’ contains knives, but mainly consists of cast bronze double axes with oval shaft holes. The predominant type of axe is the Helladic one with curved blades, mainly known to us from Mycenaean hoards (note 6). 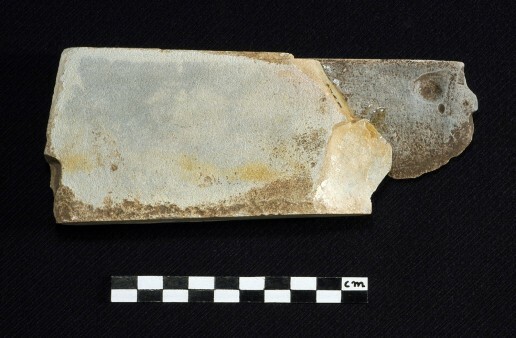 There is a preference in Epirus for wing-shaped blades, which result from heavier hammering after their removal from the mould (two bivalve stone moulds are known to us from the Korytsa region in neighbouring Albania, note 7). Double axes of the “Ermones-Kierio” type with a raised body and neck are found scattered throughout parts of western or central Greece and neighbouring Balkans. Most axes in Epirus were used as heavy-duty carpentry tools for cutting down and shaping trees (mainly for building material and for firewood). The “armory” of the Late Bronze Age in Epirus is even more impressive. It comprises eight bronze swords from different sites, of which three horned and three cruciform (fig. 4) belong to popular Minoan-Mycenaean types of swords of the Late Helladic/Minoan ΙΙΙΑ-Β period (14th-13th centuries BC). The remaining two swords belong to the famous category of European swords, conventionally named “Naue II” and are predominantly in use during the Late Helladic/Minoan ΙΙIC period (approximately 1200-1000 BC), while the iron version of the same type was in use down to the end of the Classical era (there are examples coming from the molossian cemetery at Vitsa in Ioannina). Ten cruciform daggers with a T-shaped pommel, characteristic of the Late Helladic ΙΙΙΒ-C period, were found on various sites in Epirus. Three more knives-daggers with a hilt projection from Mazaraki in Ioannina belong to an unusual Cypriot type, while last, from Dodona in Ioannina comes an imported dagger of the Italian “Peschiera” type (fig. 5). A total of twenty two long or short swords-daggers (note 8) were used as fighting or hunting weapons and alternatively as “prestige” artifacts of a symbolic nature. Twenty five more leaf-shaped and eleven lanceolate spearheads (fig. 6) come from various sites in Epirus (note 9). A few bronze ornaments for personal use come from women’s cist graves (Elafotopos, Kalpaki, Mazaraki, Romano, all in Ioannina). These are mainly spiral bracelets, rings, tweezers and beads. Bronze pins were found at Krya and Pramanda in Ioannina and at Ephyra in Preveza. Jewellery with spiral ends are of special interest, as they are encountered in parts of Europe, while in the Helladic area are only to be found from the Late Helladic ΙΙΙC period on. Macroscopic observation of bronze artifacts offers insight into various defects or imperfections in the cast (note 10), which are indicative of the way these objects were manufactured. Thus, on the surface of tools and axes from Epirus one discovers various shrinkage cavities, wedging grooves, casting joints, gas-holes, dirt inclusions, etc. Hammering is intended to erase imperfections and form the final shape of the implements. Next comes polishing of the surface or grinding of the blades with various kinds of whetstones. Decoration is either imprinted in the mould or chiselled onto the object after removal from it (fig. 7). There are evident signs of use-wear on the implements’ blades, visible as damage of various kinds or dentations, while breakings make them completely useless. Experimental archaeology of the last decades provides evidence that prehistoric tools had many different uses (note 11). Metallographic microstructure analysis, chemical composition and lead isotope analysis have been applied for the first time to samples of prehistoric implements from Epirus (note 12). The purpose of metallography is to enlarge the surface metal structure of the sample, in order to detect the way in which these were cast and forged. Polished sections of sampled metal objects are examined under an optical microscope. Metallography of implements from Epirus reveals polygonal crystals of various sizes and shapes as result of recrystallization after annealing (that is heat treatment at a correct temperature to ensure that metal can be worked further without breaking). Crystal deformation on the blades suggests hammering after annealing. The processes of annealing and hammering would have been repeated, depending on the desirable final use of the object. The secret usually lies in the correct balance between hardness and durability (note 13). Tin-bronze is recognised as the predominant Late Bronze Age alloy. This alloy was the result of years of experimentation or of collective knowledge, leading to the manufacture of products that had the necessary properties to serve specific uses. The transition from arsenic to tin was the result of the first element’s dangerous toxicity, which can cause death to human beings and pollution to the environment. Chemical analysis of implements from Epirus with Energy Dispersive X-Ray Fluorescence (EDXRF) traced an ideal proportion of copper (85-92 %) and tin (7,6-14,1 %) for casting of functional implements with the necessary hardness (only by hot forging). The lead isotope analysis was undertaken with Multiple Collector Inductively Coupled Plasma Mass Spectrometry (MC-ICP-MS), but, accepting this, involves quite a few theoretical questions and the relevant conclusions will be discussed elsewhere. 1. Evidence of local metalworking activity is provided by relevant finds (mainly moulds), coming from settlements of the Late Bronze and Early Iron Age in neighbouring Albania (Maliq, Sovjan), in Macedonia (Kastanas, Assiros, Toumba, Aghios Mamas) and Thessaly (Dimini, Kastro-Palaia, Sesklo). 2. E.-L. Schwandner / G. Zimmer / U. Zwicker, «Zum Problem der Öfen griechischer Bronzegiesser», Archäologischer Anzeiger 98 (1983), p. 57-80. An exemplary and interdisciplinary presentation of a metallurgical kiln belonging to the 2nd century BC. 3. There are fifteen hoards known to us, dating to the Late Bronze Age in Greece: five from Mycenae (with the conventional naming: Acropolis, Tsountas-2, Poros Wall, Mylonas) and one from Tiryns in Argolis. Also, at Orhomenos and Anthedon in Boeotia, at the Athens Acropolis and at Kanakia in Salamis, at Polis in Ithaca, Kalydon in Aitoloakarnania, Kierio in Karditsa, at Stefani in Preveza and Katamachi in Ioannina. A similar recent find is reported as existing at Aghios Vasileios in Lakonia. The older finds are published in: Θ. Σπυρόπουλος, Υστερομυκηναϊκοί Ελλαδικοί Θησαυροί Αthens 1972. 4. Ι. Βοκοτοπούλου, «Θησαυρός χαλκών πελέκεων εκ Καταμάχης Ιωαννίνων», Αρχαιολογικά Ανάλεκτα εξ Αθηνών 5 (1972), p. 112-119. The hoard was discovered and delivered to the authorities by the farmer-shepherd D. Doulis. It is probably connected with the network of mountain passages in the region, which has yet to be adequately studied. 5. Η. Ανδρέου, «Νέες προϊστορικές θέσεις στην Ήπειρο», in Χ. Τζουβάρα-Σούλη / Α. Βλαχοπούλου-Οικονόμου / Κ. Γραβάνη-Κατσίκη (eds. ), Φηγός: Τιμητικός τόμος για τον Καθηγητή Σωτήρη Δάκαρη, Ioannina 1994, p. 243, 259. The hoard was discovered and delivered to the authorities by the farmer-shepherd Th. Kritsimas. 6. Α. Ωνάσογλου, Η οικία του τάφου των τριπόδων στις Μυκήνες, Athens 1995, p. 37-41, 48-49, fig. 57-58, pl. 10, 12-15. Twenty double axes were deposited in two layers at the dead man’s feet. 7. P. Léra, «Deshmi arkeologjike mbi ushtrimin e metalurgjise lokale prehistorike», Tempulli 8 (2003), p. 34. 8. The established categories-types of Aegean swords and daggers have been published mainly by N. Sandars (1963), I. Kilian-Dirlmeier (1993) and A. Papadopoulos (1998). For a revision of the relevant categories and other data (such as experimental use) see B. Molloy, «Swords and swordsmanship in the Aegean Bronze Age», American Journal of Archaeology 114 (2010), p. 403-428. 9. For the established categories-types of bronze spearheads see R. Avila, Bronzene Lanzen- und Pfeilspitzen der griechischen Spätbronzezeit, Prähistorische Bronzefunde 5/1, Munich 1983. 10. M. Lowe Fri, The double axe in Minoan Crete: A functional analysis of production and use, Stockholm 2007, p. 44-73. She deals with different aspects of the construction and use of Minoan double axes. 11. Lowe Fri, op.cit., p. 93-127, where it provides experimental evidence on the use of double axes in felling trees, dressing stones and cutting animals’ bones. 12. Metallographic microstructure analysis took place in an Austrian laboratory, while chemical composition and lead isotope analysis was carried out in a German laboratory. Thanks are due to the Institute of Aegean Prehistory (INSTAP-USA) for funding of the project. 13. For the process of the evolution of microstructure and other technological aspects see G. Papadimitriou, «The technological evolution of copper alloys in the Aegean during the prehistoric period», in I. Tzachili (ed. ), Aegean metallurgy in the Bronze Age, Rethymnon 19-21 November 2004, Rethymnon 2008, p. 271-287. Ανδρέου Η., «Νέες προϊστορικές θέσεις στην Ήπειρο», in Χ. Τζουβάρα-Σούλη / Α. Βλαχοπούλου-Οικονόμου / Κ. Γραβάνη-Κατσίκη (eds. ), Φηγός: Τιμητικός τόμος για τον Καθηγητή Σωτήρη Δάκαρη, Ioannina 1994, p. 233-265. Avila R., Bronzene Lanzen- und Pfeilspitzen der griechischen Spätbronzezeit, Prähistorische Bronzefunde 5/1, Munich 1983. Βοκοτοπούλου Ι., «Θησαυρός χαλκών πελέκεων εκ Καταμάχης Ιωαννίνων», Αρχαιολογικά Ανάλεκτα εξ Αθηνών 5 (1972), p. 112-119. Léra P., «Deshmi arkeologjike mbi ushtrimin e metalurgjise lokale prehistorike», Tempulli 8 (2003), p. 30-38. Lowe Fri M., The double axe in Minoan Crete: A functional analysis of production and use, Stockholm 2007. Molloy B., «Swords and swordsmanship in the Aegean Bronze Age», American Journal of Archaeology 114 (2010), p. 403-428. Papadimitriou G., «The technological evolution of copper alloys in the Aegean during the prehistoric period», in I. Tzachili (ed. ), Aegean metallurgy in the Bronze Age, Rethymnon 19-21 November 2004, Rethymnon 2008, p. 271-287. Schwandner E.-L. / Zimmer G. / Zwicker U., «Zum Problem der Öfen griechischer Bronzegiesser», Archäologischer Anzeiger 98 (1983), p. 57-80. Σπυρόπουλος Θ., Υστερομυκηναϊκοί Ελλαδικοί Θησαυροί, Athens 1972. Ωνάσογλου Α., Η οικία του τάφου των τριπόδων στις Μυκήνες, Athens 1995.